Security researchers at Sophos labs found some phishing scams using Google Docs to steal Google account login details. Google Docs is the free service by Google which allow users to create online forms. See the phishing page which asks for users’ passwords. 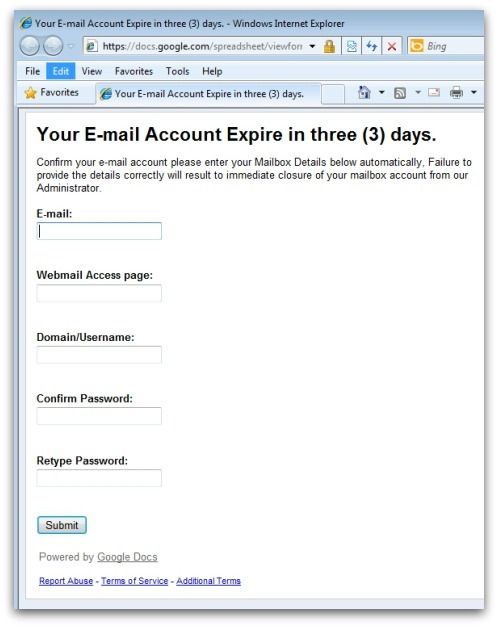 Gmail account password is really very important as it is linked to various of your Google Service. This is gonna hit you badly. So you must know how to protect yourself from these kind of risks. At Sophos labs, security researchers have found many these kind of phishing scams which claims dufferent things but use Google Docs to steal users’ Gmail login credentials. Google Docs service is available foe free so any user can create online form and use it. As the form will be hosted by Google, so most of the innocnt user believe on the forms expose their logini credentials to scmmers. This entry was posted in General and tagged gmail, hack, scam, spam. Bookmark the permalink.